“Habemus Pappam” rang from the Vatican today- a Latin phrase meaning” we have a Pope”.Bible Protestants everywhere should have no illusions as to who Joseph Ratzinger is or where he stands. Cardinal Joseph Ratzinger of Germany has been head for many years of the “Sacred Congregation for the Doctrine of Faith” and a chief adviser to Pope John Paul II. He is known to be an arch-conservative on doctrinal issues with the RC church. This is especially brought out in his document issued on 09/05/2000, “DOMINUS IESUS”. “As Grand Inquisitor for Mother Rome, Ratzinger keeps himself busy in service to the Truth: correcting theological error, silencing dissenting theologians, and stomping down heresy wherever it may rear its ugly head — and, consequently, has received somewhat of a notorious reputation among the liberal media and ‘enlightened’ intelligentsia of pseudo-Catholic universities”. And so in the tradition of the centuries of Inquisition before him, this man fancies himself a guardian of the faith—but it bears no resemblance to the “faith once delivered unto the saints” (Jude 3)-but more resembles the faith of Aaron and his golden calf. (9)The kings of the earth drink eagerly out of her cup. The fact is that all of the Reformers to a man recognized the Pope of Rome to be the Antichrist and denounced him as such. The state of apostasy in today’s church is so great that we are drowning in a tsunami of praise for the late Pope and his successor, who are peddlers of goddess and wafer worship–rank idolaters! – Scriptures alone are our rule of life and faith. – Everything is to be done only for the glory of God. – Salvation is by Christ alone. – Salvation is by grace of God alone. – Salvation is by faith alone. I welcome your feedback and questions. A letter received by this writer on 4/16/05 from Linda Wolfe announced her conversion and that of her husband to the Roman Catholic Church. Linda Wolfe is a long-time pro-life activist whose web page can be found at the Army of God website. Her letter states in part: “All the pieces of Scripture finally fall in to place…. I am absolutely convinced that here in the Roman Catholic Church is the fullness of His teaching and truth…..
How tragic it is to be so totally deceived and blinded by Satan! Linda Wolfe is a former Pentecostal believer who has now defected to the Church of Rome, calling it “peace and joy”. But it is the peace of a spiritual graveyard and home of doctrines of devils. The idolatry of creating a wafer-God, the “Eucharist” and bowing down in the “Veneration of the Blessed Sacrament”—an exercise in utter blasphemy and heresy. Confession of sins to a priesthood riddled with pedophiles and homosexuals. There is nothing awaiting these tragic souls and their apostasy but spiritual slavery and death. Not being raised in the RC church, (as this writer) they have been lured into the spiritual quicksand of endless Masses and Novenas that will avail them NOTHING. I totally renounce the RC church and her foul lies and heresies-as evidenced by my re-baptism as a believer in the Bible Presbyterian church ca. 1980. I denounce the RC church as the Mother of Harlots and Abominations as seen in Revelation chapters 17 and 18 – Babylon the Great. AND I CALL UPON THOSE WHO HAVE DEFECTED TO THAT BOGUS CHURCH THAT IS DRENCHED IN THE BLOOD OF THE MARTYRS OF THE REFORMATION TO REPENT BEFORE IT IS TOO LATE-YOUR SOULS ARE AT STAKE. Pro-life activist Jill Stanek thanks the late Pope John Paul II and the Roman Catholic Church for their pro-life work and teachings. Calling the late Pope a “great man”, Jill expresses her admiration by saying her mind was “blown” after she read the Papal encyclical “Humane Vitae” and that the world needs an “unwavering Pope”. There are a few facts you overlooked, Jill. If you were one of the hundreds of victims of sexual abuse at the hands of Roman Catholic priests-would you call this a “pro-life” activity, Jill? Do the lives of these already-born victims of sexual abuse not count as much as the lives of the unborn? Cardinal Law and the Boston Archdiocese. Cardinal Roger Mahoney and the Los Angeles archdiocese. In fact, the Vatican’s own documents prove complicity and cover-up. Those of us who have been saved out of the darkness of Roman Catholicism into the glorious light of the true gospel and Bible Christianity are not deceived by the late Mary-worshipping Pope or his devilish institution, Jill. We know it for what it is—a fraud and a spiritual counterfeit that leads people not to the light-but to hell. And to commend the Pope and his church of false doctrines for their “pro-life” work is a mockery of the thousands of children and women that have been abused at the hands of the Roman Catholic priesthood. The present location of “pro-life” Pope John Paul II has been very ably described by Dr. C. Matthew McMahon at his website. and let no Bible-believing Christian ever be deceived by the façade of this counterfeit church whose future can be seen in Revelation chapter 18! By way of an announcement posted at the Priests for Life website: we have learned that long time pro-life activist, author, and Pastor, Rev. Paul Schenck has joined the Roman Catholic Church on 2/29/04. In doing so he has followed in the footsteps of men like Scott Hahn, who experienced a similar spiritual meltdown some 12-odd years ago. These departures from the faith once delivered unto the saints (Jude 3) should not shake those of us grounded in the Word of God – they were prophesied long ago. The authority of the infallible Word of God – for the errors of Popes and the commandments of men. The worship of the One True God – for the idolatry of the Roman wafer-god, the “Eucharist”. The honor that belongs to Christ alone as the one Mediator between God and Man (1 Tim 2:5 and Col. 3:17) – for the Mary-worship the Roman church is saturated and polluted with. The gospel of salvation by grace through faith – for a damnable lie of works and sacramental salvation. The freedom of the gospel – for the marketing of a mythological place called “purgatory” and indulgences. LET THIS BE A WARNING TO CHRISTIANS – THERE CAN BE NO REAL UNITY AT THE EXPENSE OF THE TRUTH OF THE WORD OF GOD-AND NO UNITY WITH THE CHURCH OF ROME, WHICH IS A FALSE CHURCH. The term “holocaust denier” came into use primarily in the last 2 decades. Men who called themselves “revisionist historians” began to publish their own version of history- a version stating the crimes of the Nazi’s did not happen. The ovens and gassing of the victims of Nazism during World War II were exaggerations-or the fabrications of “Zionists”. These evil men ignored the overwhelming evidence of genocide to further their own evil agenda of anti-Semitism. Today, the new Holocaust deniers are within the nominal Christian church. The churches are filled with those who are in denial that the abortion holocaust even exists. 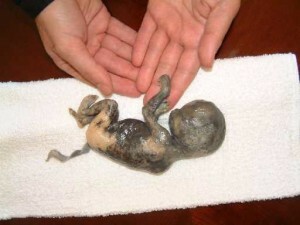 Having ears – they are deaf to the silent screams of the unborn. Having eyes – they are blind to the abortion mills in their communities. There is no ongoing genocide in the land of the free and the home of the brave for these believers. These nominal Christians are zealous in their pursuit of pot luck suppers, concerts, and movies. Their spirits have been deadened by heresies like the Prayer of Jabez and the Laodicean prosperity teaching so prevalent today. They may sing “Onward Christians Soldiers”- but they are not at war – they are asleep. 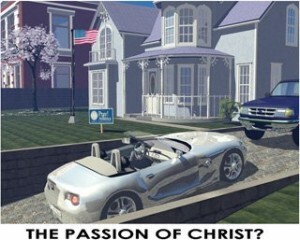 You will know them by their SUV’s, stock portfolios, and pious-sounding usage of Romans 13. That is- the Creator of this universe has now been supplanted by an American government who can decide who lives and who dies-and who is a human being and who is not. The movie theatres are filled with those flocking to see a “Passion” movie—where is their passion to defend infants created in the image of God who are being dismembered and having their skulls crushed? The following Scriptures are plain enough for those with a heart for anything other than the quack theology of self-absorption that is enslaving the church today. “Defend the poor and fatherless; do justice to the afflicted and needy. “Bring no more vain sacrifice; incense is an abomination to Me; the new moon and Sabbath, the going to meeting; I cannot endure evil and the assembly! Your new moons and your appointed feasts My soul hates; they are a trouble to Me; I am weary to bear them. And when you spread out your hands, I will hide My eyes from you; yea, when you make many prayers, I will not hear; your hands are full of blood. Only one thing can save the Church in America from the judgment that is to come and that is true repentance-and action. A CALL FOR RESISTANCE-WHAT WILL YOU DO? The hands that are raised in praise to God on Sunday morning can carry a graphic sign on Saturday morning. Voices raised in glossolalia on Sunday morning can be raised in protest against genocide on Saturday morning. Those who are neither vocal nor picketers can hand out literature against the killing of innocent children. Please prayerfully consider how you can help witness to the gospel and defend these womb children from being killed. Every death camp in this country should be under siege from a militant Body of Christ. RESIST THE AMERICAN HOLOCAUST ! CRANFORD, NJ – When pro-life activist Joe Pavone reported to work on 12/29/03, he expected a typical day in a corporate accountants life. The processing and reporting of financial information can be a repetitive and mundane task. What he got instead was a pink slip. Assigned to the commercial loan giant “CIT Group” in Livingston, NJ by his employment agency, Pavone was told nothing by this corporation about its Internet usage policy. In using his managers logon the previous week-he noted that the bookmarked Internet sites included websites that were clearly of a non-business nature. On his lunch hour, Pavone visited several pro-life websites like lektrik.com, covenantnews.com, and mttu.com. After reporting to work on 12/29/03, Pavone was called by his employment agency and told that the CIT Group Inc did not need his services anymore and to leave the building. Only after he left was he phoned again by his agency and told the reason behind his termination. Shruti Choksi, a manager at CIT Group, had noted that Pavone had visited the aforementioned pro-life sites and complained to her supervisor, Robert Oberlander. Oberlander then phoned Pavone’s agency and told them that he and Choksi were “offended” that Pavone had visited pro-life sites, and they would no longer need his services. Pavone was told by his agency not to visit pro-life websites ever again and not to even discuss abortion, or any of his beliefs again when on assignment. On 12/22/03 I reported to the CIT Capital Equipment Finance accounting group on a contract job assignment from my agency. This group is headed by Robert Oberlander (Supervisor) and Shruti Choksi (Manager). I worked the next day-12/23/03- also; however when I reported for work on 12/29/03 I was informed that my services were no longer needed. The reason? I was told by my agency that Oberlander and Choksi were offended by my having accessed “anti-abortion” websites the previous week on my computer. It is I who am offended now – very offended. I find the bigotry displayed by Robert Oberlander and Shruti Choksi towards the pro-life position to be discriminatory and offensive. At no time was I ever told of CIT’s policy on Internet usage- or what constitutes a violation of that policy. While using the logon of Shruti Choksi on 12/23/03 I noted she herself had several websites bookmarked that were totally of a non-business nature. One of the websites in fact dealt with the health and well-being of infants. I share Shruti’s interest in the health of infants—both born and unborn. Why is it permissible for Shruti Choksi to have personal Internet usage but not myself? Is there a double-standard here? Does CIT have one policy for its own employees and another for its contract employees? On November 11, 2003, Stephen Jordi was arrested in Miami, Florida, for allegedly plotting to bomb abortion clinics. Two days later, his pastors at the First Baptist church at Hillsboro disclosed to the media that they had warned the police on November 7th of their former church member’s view regarding abortion and violence. See the memo sent to the police by Pastor Jerry Williamson. Instead of pursuing the matter with Stephen Jordi, these “pastors” cravenly turned over the sheep to those who defend baby killers! Instead of laying down their lives for the sheep – they laid down Stephen Jordi’s life by betraying him to pagans. One can only pray that the flock of Pastors Williamson and Hunter will NOT follow their example and turn into quislings, who betray their brothers and sisters in Christ to the authorities. Williamson and Hunter would not find congregations among the Persecuted Church – underground churches such as those in Cuba and China would laugh at their poodle-like behavior in total scorn. With the martyrdom of Rev. Paul Hill, the time has come to examine the parallels between his actions and those of the German Christian, Rev. Dietrich Bonhoeffer. May the courage of these men inspire those of us who are pro-life to likewise sacrifice in our battle to defend unborn children. Bonhoeffer and Hill were clergymen who were at odds with the passivity and cowardice of their fellow Christians to resist a holocaust. Dietrich Bonhoeffer was a Lutheran pastor who did not hesitate to warn his fellow Germans about the evils of Hitler’s regime – his initial penalty was the persecution of the Gestapo and his silencing. Paul Hill witnessed the abortion holocaust as a Presbyterian minister in Pensacola, Florida – and determined to resist it. Both men spoke out for years at a cost to themselves and their careers as clergymen-but were determined to defend the defenseless. An evil government that allowed the extermination of a segment of its population, and the silence of an emasculated church, intimidated neither man. But the courage of these men was not limited to words and to speechmaking – nor was it confined to praying in seclusion. These were men of action! When Dietrich Bonhoeffer became aware of the genocide being directed against the Jews, and the Holocaust in general – he joined the Resistance to the Nazi regime, as he was not a man to hide in his office while millions were being butchered. He did not shrink from what he saw as a moral duty to confront evil. Bonhoeffer became involved in the plot to assassinate Hitler – knowing that it could cost him his life. He was arrested in April 1943 on suspicion of being a plotter against the Nazi regime; subsequently an assassination attempt against Hitler failed on July 20,1944. Bonhoeffer was hung at Flossenburg prison on April 9,1945 for his resistance to the murder of millions by the Nazis. Paul Hill defied a pro-life community paralyzed with pacifism and worked openly to assert the principle that unborn children deserved the same protection from murder that children already born did. Hill was not afraid of being a pariah to a church utterly cowed by the American government. He issued statements defending the principle of using force, regardless of the cost to him personally. Finally, Paul Hill took up arms to end the baby killing of abortionist John Britton – knowing that this act of courage would mean leaving his family, the end of his own freedom, and cost him his life. To the very end of their lives, Bonhoeffer and Hill refused to recant their beliefs that their actions were justified. There was no retreating for these men of God. They were not ashamed that their fight against murder had put them in prison. With their lives at stake, they bravely upheld the principle of active resistance to evil and evil governments. The Nazi holocaust and the American murder of 45 million unborn children did not conquer the spirit of these men. They followed Christ in life and in death and challenge us to do the same today. Bonhoeffer and Hill laid down their lives gladly for what they believed. Neither man hid behind Romans chapter 13 or attempted to escape his duty to defend the defenseless. What can be done to fight the American holocaust of the unborn and honor the memory of these martyrs for Christ? Be a tireless witness for the unborn at your church-ask your Pastor and elders what they are doing about the 3,000 (or more) babies being butchered each day in our country. Then educate your fellow churchgoers with literature about the evil of abortion and the necessity of the church to take action. Do sidewalk counseling/picketing at your local abortuary! For information on sidewalk counseling. One of the most potent weapons we have to demonstrate the humanity of the unborn child and the barbarity of abortion is by using graphic signs. There are a variety of signs available and they are a powerful witness that has changed the minds of many women about to enter the abortion mills. Your reaction to the martyrdom of these men will help determine if they have died in vain. To do nothing in the face of the slaughter of the unborn is fear and cowardice. All of us are not called to be martyrs – BUT WE ARE ALL CALLED TO BE DISCIPLES (John 8:31). The Lord Jesus has admonished us to be salt and light (Matt. 5:13,14) and His Word tells us that faith without works is dead. (James 2:14-18). Whether the Lord has called you to resist evil as these courageous men did, or in other ways – RESIST! The scene was set at the courthouse in Buffalo, N.Y. Today, May 9, 2003, is to be the day that Jim Kopp is thrown to the lions- expecting to be sentenced to life in prison for the termination of Barnett Slepian, the baby killer. For months, the Buffalo News ran columns, “news stories”, and “letters to the editor” mocking Jim Kopp and those who would defend him. They denounced Kopp as the killer instead of Slepian the abortionist – the one who killed God’s children (and reaped the righteous judgment of God). The wife and sons of the baby killer were present to see “justice” done, and the defender of the unborn sent away in humiliation. “Why should the safety of Dr. Slepian be put over the safety of unborn children?” he asked. I wish I could do 10 life sentences or 10 death penalties to save them. With that statement-Jim Kopp stood tall for the unborn. He refused to admit guilt where there was none. With nearly everyone arrayed against his courageous action, and the full force of the legal system about to be put upon him, he called the abortionists what they are – murderers – and refused to apologize. May God bless Jim Kopp for his brave testimony and life of action against the slaughter of babies. May God bless Jim Kopp for standing tall and refusing to be intimidated by the overwhelming forces arrayed against him. And may God raise up more defenders of the unborn like Jim Kopp. Today, May 9, 2003 Jim Kopp stood tall! It is clear from the present state of affairs in America that the Evangelical church in America is largely apathetic regarding the murder of the unborn. This is not just my observation, it has been noted by others in the Body of Christ as well. Why the silence? Why the failure to resist a Holocaust that surpasses the Nazi horrors of WW II? My own experience in speaking and witnessing to other members of the Body of Christ is that fear and illusions regarding the American Government are blinding believers from taking any action to defend the unborn. The fear of man will always bring a snare to the fearful (Proverbs 29:25), but why the illusions regarding the moral and lawful authority of the present American Government? Even worse, the ludicrous placing of faith placed in purported Christians like Bush and Ashcroft shows how deeply this fear and illusion have set in. The only thing noteworthy Bush has done as President is to allow the evil practice of stem cell (read: cannibalism) research to continue. It is pathetic that Christians fall all over themselves, groveling for crumbs, when Bush talks about ending partial-birth abortion. WHAT ABOUT ALL THE OTHER MURDERS BEING COMMITTED THAT HIS ADMINISTRATION IS DOING NOTHING ABOUT? In the case of John Ashcroft, his allegiance to Caesar and betrayal of Christ is blatantly obvious for all who have eyes to see: he issues injunctions curtailing free speech at the abortuaries and allows men of God who even pray there to be arrested. Lastly, Christians should ask themselves: if this Administration is truly a friend of the unborn, why does it not attempt to repeal the “FACE” act of 1994 which was enacted to protect the baby killers from the protests of those who would defend the unborn? The answer is that this government and administration have no legitimacy in the eyes of a HOLY GOD WHO SEES AND HEARS THE SILENT SCREAMS OF THE UNBORN AND WILL SURELY JUDGE AMERICA FOR THIS SLAUGHTER OF THE INNOCENTS. Having unmasked this American government for what it is-an accessory to the murders of millions of children-what can the true disciples of Jesus Christ do with this realization? a) Picketing, sidewalk counseling, and pamphleting at their local abortuary.